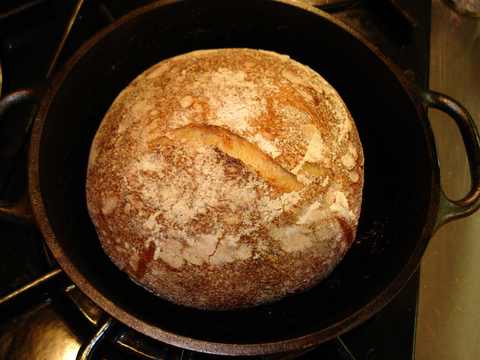 Charmed as I was by the stellar performance of my little Lodge cast-iron 2 quart Dutch oven, I set out to see how it would work with my basic sourdough bread (a 500 gram Dough). I made it exactly as I always do (it's in the Bread Bible) and the finished size of 6 by 3 1/2 inches was exactly the same as before although the shape seemed more perfectly smooth and rounded like a pebble. 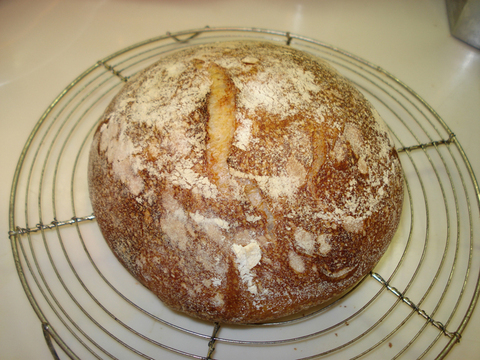 After eleven no knead breads the beautifully complex and tangy flavor of this one was a relief from the ordinary. Curious to see if I could arrive at the same lovely open crumb texture of the no knead bread with a sourdough bread I increased the hydration to 80% for my next trial. My husband dubbed the bread an anomaly, which I found to be the perfect descriptor. 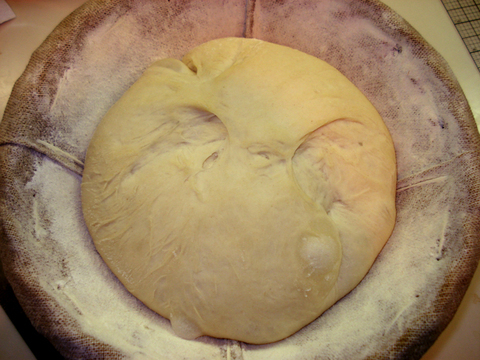 On shaped rising, it puddled from 6 inches to 8 inches and stuck mercilessly to the heavily floured Silpat while transferring it into the hot pot. The baked bread was pasty on the inside with streaks of flour in the middle where some of the upper crust landed while trying to get it into the pan. I seem to remember that I may have tried making a sourdough with higher hydration several years ago because it seems very familiar. Some lessons we have to learn more than once. So what I learned from the first experiment is that the hot pot technique works wonderfully with the rustic breads other than the no knead (as I suspected). And that the best way to transfer sour dough bread into the hot pot, after it has risen in the banneton, is to sift flour lightly on the top of the dough, invert it onto the removable bottom of a tart pan with a nonstick surface, or coated with baking spray. It will spread out to about 7 inches, but don't worry. Simply slide it into the hot pot. During baking it will draw in and rise up perfectly. Here's proof of its survival!